Passion for tone that inspires greatness! 0 units are currently available. *Optional knob styles are available. See examples below. The Ghost Drive is a hand crafted versatile low-medium gain overdrive and clean boost designed specifically to enhance an already outstanding guitar and amp combination. Boost and Drive sections, with reversible order, work independently or complementary. Each circuit is inspired by several great pedals/builders that made a significant difference in the way we play and use gear. The design goal of the Ghost Drive was to leverage these ideas into one pedal to create an unusually versitile and inspiring overdrive/boost to equip the player for most any environment where they need an outstanding drive tone. From extremely transparent chime to warm/fat/rounded chunk. This is certain to be one of the most useful low to medium gain pedals you'll ever own. The drive side features: selectable clipping for early or late breakup in tight/focused or loose/amp-like forms; a subtle tone circuit which warms without dulling attack, invigorates highs without becoming harsh, and avoids overly accentuated mids associated with classic overdrives; the ability to re-introduce pure/clean input with the overdrive signal which gradually replaces any fullness or chime lost during clipping. 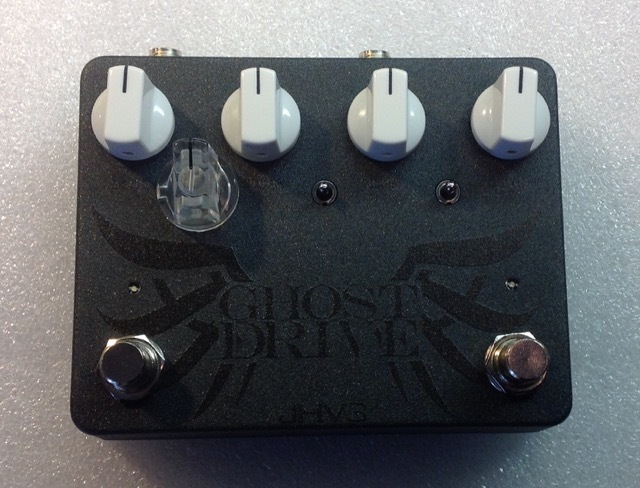 The Ghost Drive excels as a exceptional tone protecting overdrive and boost that inspires you play! Rich low/medium gain overdrive paired with an independent clean boost. The separate clean boost circuit provides over 25db of clean signal boost to stand out or induce natural pre-amp overdrive. An internal gain adjustment (via trim pot) allows the flexibility of adding a nice edge when turned up past 12:00, or taming the output for clean headroom throughout the range of the level control. Overdrive section utilizes the “pure” knob to reintroduce a buffered pre-clipping signal back into the signal chain before it leaves the overdrive through the volume control. An internal trim pot adjusts the level of the pure signal to further fine tune the presence of both signals at the output. Effect order switch with current order indicated by the color of the "pure" adjustment. The illuminated knob indicates which effect is last in line: (blue=drive after boost, white=boost after drive). This flexibility creates an all new pedal with different dynamics when both effects are active. Microcontroller system manages switching and indicators.